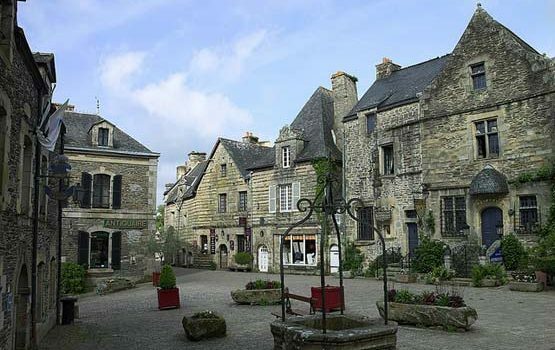 The old city of Rochefort-en-Terre is one of the most remarkable sites in Brittany. Recognized as the “favourite village of the French” in 2016, it is distinguished by its pretty cobbled streets lined with traditional stone and timber-framed houses. With its pretty boutiques, its dozens of galleries and its warm craft shops, Rochefort-en-Terre comes alive all year round and is really worth a visit. The locals take the art of living and the sense of welcome very seriously, so that visitors often want to come back. The village of Rochefort-en-Terre stands on a rocky spur overlooking the Gueuson valley, in the middle of the moors and woods, about thirty kilometres east of Vannes, in the Morbihan. It is crossed by the river Gueuzon. It is one of the most beautiful villages in France. Rochefort-sur-terre is a real concentrate of old houses and shelters a great diversity of architectural monuments reflecting the currents of yesteryear. From timber-framed houses and lauze roofs to modern buildings, Gothic style buildings and residences dating from the Renaissance, some visitors come here especially to admire its constructions that highlight the stone in all its states. The village of Rochefort-en-Terre is like a real open-air museum that exhibits a rich diversity of old houses. Geraniums and ivies, as well as creeping plants clinging to stone walls give it a crazy charm. In summer, the village is entirely pedestrian to encourage conviviality and rapprochement, while in winter, around the end of the year celebrations, it offers a magnificent bright Christmas market, among the most beautiful in France. More than 30 km of garlands decorate the village sky during this period. More than 500,000 tourists visit the village each year. With a population that has never exceeded 800, it is entirely dedicated to the tourism sector. 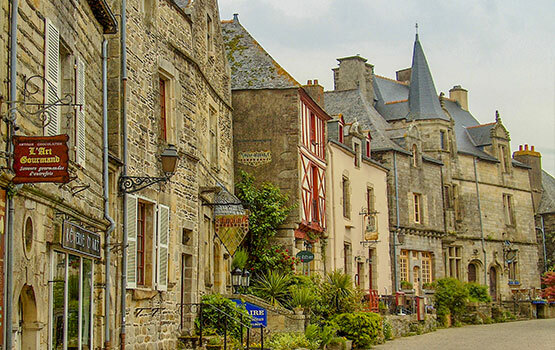 Over time, Rochefort-en-Terre has become the landmark of artists and artisans in Morbihan. 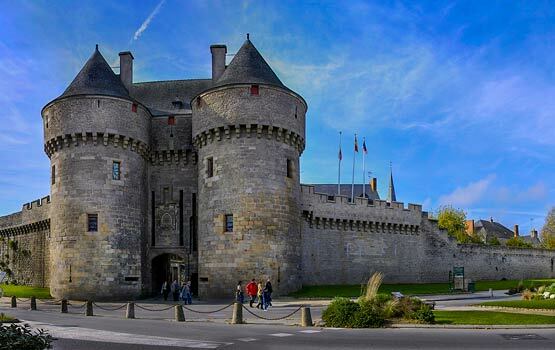 The buildings are essentially hotels, inns, shops, workshops, shops, cafés, restaurants… The oldest building, which was at the origin of the construction of the village, is the Château de Rochefort-en-Terre built in the 12th century, then rehabilitated 5 centuries later. The village developed from the castle which housed a powerful seigneury. In the 20th century, the castle takes a new turn and becomes a manor where is held a rich collection of works of art telling the history of the region. The splendid village of Rochefort-en-Terre offers you a journey out of time! The famous zoological park of the castle of Branféré was designed to amaze animal lovers and those concerned with respect for nature. More than 1,000 free-ranging animals (120 species) from the four corners of the world are gathered in an immense 40 hectare setting that reflects their natural habitat. 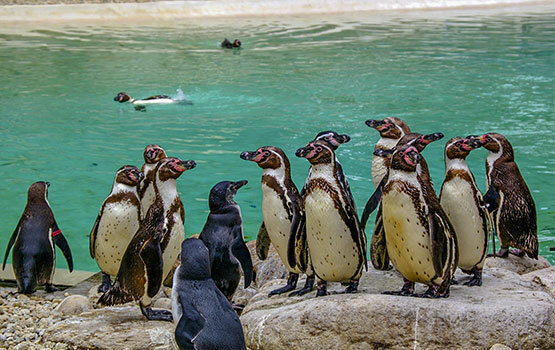 It is a branch of the Pôle Branféré in the same way as the Nicolas Hulot School for Nature and Man, and welcomes more than 200,000 visitors each year. Branféré Castle was built in 1848. 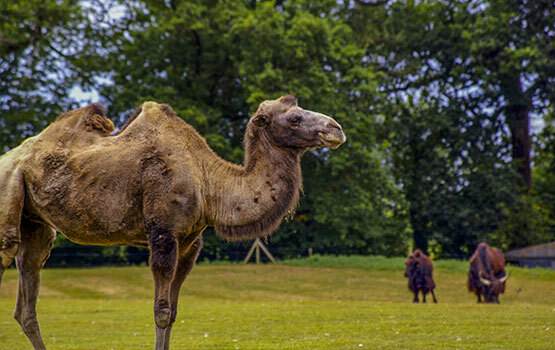 Its first owners were the aristocratic family of Casimir Jourde, but it was the grandson of the latter, Paul Jourde, who had the idea of creating a botanical and animal park there. Paul Jourde shares with his wife, Elena Castorie, a passion for wildlife. It was during a trip to India, where he discovered for the first time an animal reserve in which animals lived in freedom, that he decided to make his castle a “paradise for animals”. Great explorer, Paul Jourde traveled across the 5 continents and brought back various exotic animal and plant species. With the help of numerous biologists and scientists, he created a biotope preserved within his property to ensure the well-being of each species he welcomed. The project was a real revolution in the field of zoology. Since its opening on July 27, 1965, and until today, this park has been a great success. With the emergence of ecology and green tourism today, this site is among the most visited in Morbihan in recent years. The management of the park was bequeathed to the Fondation de France in 1988. Branféré Park is distinguished above all by its educational character, seeking to naturally sensitize visitors to respect biodiversity. 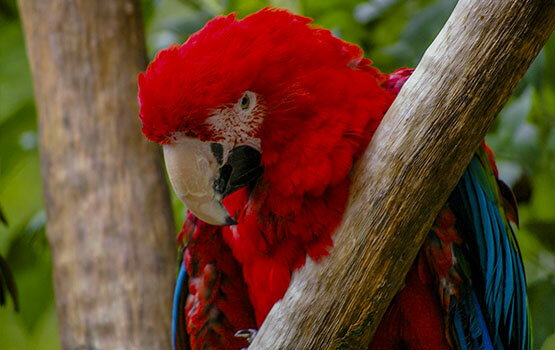 There are also many species of birds such as pelicans, eagles, storks, parrots, parakeets, vultures and many others. One of the highlights of the park is the bird show, which presents a breathtaking aerial ballet. Discover the impressive 5 ha African plain, the largest in Europe, where African savannah animals live together: giraffes, wildebeests, hippos, large kudus, zebras and oryx. Primates and lemurs, as for them, are in the famous Parcabout of 3 000 m² where the visitors will be able to relax in large nets suspended between 2 to 8m above the ground, between the trees, while observing these animals moving from branch to branch. Plant species and botanical curiosities are as numerous as they are diversified. Among the most fascinating, there is the 300-year-old weeping plane tree of the Orient, 40 m wide, which is classified as a “remarkable tree of France”. It is also home to sequoia sempevirens, which are among the largest trees in the world and have leaves that remain green all year round. 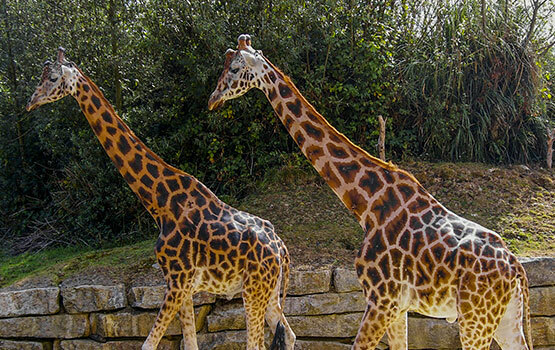 Branféré Zoological and Botanical Park has 4 main functions: educational, recreational, ecological and scientific. It offers themed formulas and various catering options that emphasize sustainable development. New and unforgettable experiences await you in the fabulous Branféré park. You will learn to respect nature more! Immerse yourself in the heart of more than 2,000 years of history in the fortified town of Vannes, city of the Venetians and heritage centre of Morbihan, in Brittany. This municipality classified City of Art and History shelters a rich heritage perfectly preserved thanks to the actions carried out by the locals. 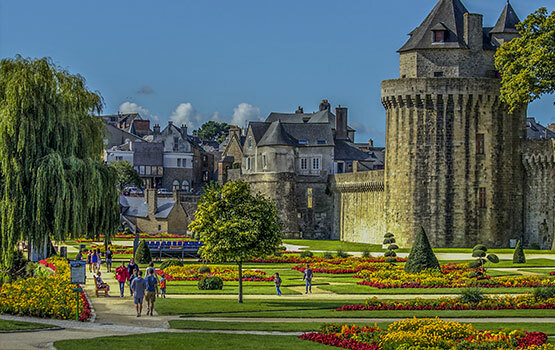 From antiquity and the Gallo-Roman era, to the contemporary era, Vannes shines by its political power of yesteryear and by its prosperity on the economic level. Its narrow cobbled streets and the medieval doors of its timber-framed buildings make all its charm and contribute to its authenticity. Valves is one of the last remaining fortifications in Brittany. The first ramparts were erected around the 3rd century AD by the Romans, but it was not until 10 centuries later that they were consolidated and extended to protect the city. A large part of the ramparts and the castle of Hermine, which unfortunately disappeared, were dismantled by King John IV who wanted to sell the stones to finance his war. But despite this, the vast majority of the remains of antiquity have remained intact and form a valuable heritage that still fascinates visitors. Many public gardens and green parks embellish the city, which earned it the classification of 4 flowers. Vannes also opens onto the Gulf of Morbihan through its magnificent marina. The boats moored there offer you to discover the marine faunistic and floristic beauty via a mini-cruise. During your stay in Morbihan, do not miss to visit the cathedral Saint-Pierre de Vannes which combines Romanesque and Gothic style, all in the center of the city. Further on, the Place des Lices is waiting for you to eat on the terrace while admiring the colourful half-timbered houses typical of medieval times. Visit these medieval districts to discover fortifications, ramparts and cathedrals with unique architecture. This fortified city has lost none of its mythical charm. Stop at La Cohue to discover the impressive collection of the Fine Arts Museum. Visit the cathedral of Saint-Vincent, but also the Gréguennic bastion with its famous battery of casemates. You will have the opportunity to pass by the Calmont Tower with two passages which presents all the characteristics of a medieval gate, but also to see the Connétable Tower, the highest of the building. In Vannes, gourmet breaks will also be on the programme with its purely Breton crêperies and its restaurants highlighting the rich local products. The good seafood, freshly collected from the neighbouring ports, sublimate the tables of the restaurants of Vannes. You won’t be short of ideas to make your stay in this splendid medieval port city which borders the Gulf of Morbihan, one of the most beautiful bays in the world. Located at the edge of the Atlantic, in Morbihan, the famous castle of Suscinio which made famous the commune of Sarzeau was classified historical monument in 1840. At that time, it was still in ruins, but its cultural value and its turbulent past earned it a place of choice among the major sites of Brittany. It is the favourite residence of the Dukes of Brittany, located on the Rhuys peninsula. It can be visited in different ways (individually, in groups, with a guide or as an audioguide) and is open to the general public all year round, but at different times, depending on the season. The castle of Suscinio includes a large courtyard, a second dwelling less imposing which is added to the first, six towers and two curtains. In 1532, the ducal dynasty was replaced by royalty which contributed to its consolidation. Comfort, lighting and ventilation have been improved over the years by successive owners. During the French Revolution, the castle was heavily damaged. It ended up being bought by a merchant from Lorient who exploited it as a stone quarry. A powerful family of aristocrats who later bought the castle tried to restore it, but it was not until it became the property of the Morbihan department in 1965 that the castle was restored to its present state. The restoration work took almost 50 years. From 1990 to today, it is controlled by the Direction des Musées de France and houses an ever-growing museum, with increasingly impressive collections. Auray developed around its famous port of Saint-Goustan to which we owe the port development of the coast around the 17th century. Since then, it has become a great not-to-be-missed place, characterized by a soft atmosphere that has seduced some artists who have made it their home. Auray is crossed by the river that gave it its name and which flows into the Gulf of Morbihan, and the neighbouring communes are Brech to the north and Pluneret to the east. 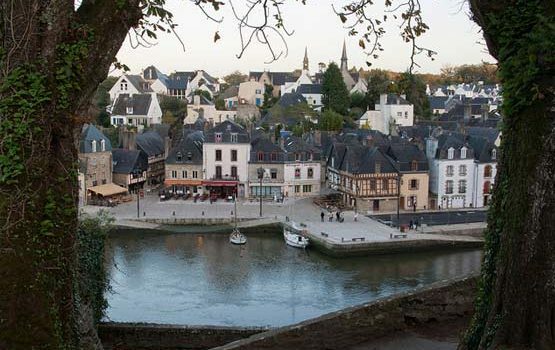 Auray was classified as a City of Art and History in 2006 by the Ministry of Culture, and since then, it has come alive to the rhythm of various cultural events combining music and modern art that take place throughout the year. 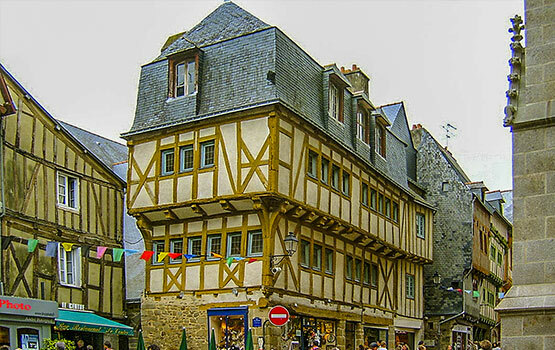 It is located about 20 km east of Vannes with which it has some similarities in the architecture of its old buildings. It is the city centre of the smallest country in Brittany, but it is also one of the most touristy. The charming marina of Saint-Goustan is one of its main attractions. Yachts and small boats offer river cruises to the Gulf of Morbihan, to reach the islands for a pleasant excursion. This port has kept its ancient aspect which pleases visitors who have come to recharge their batteries. 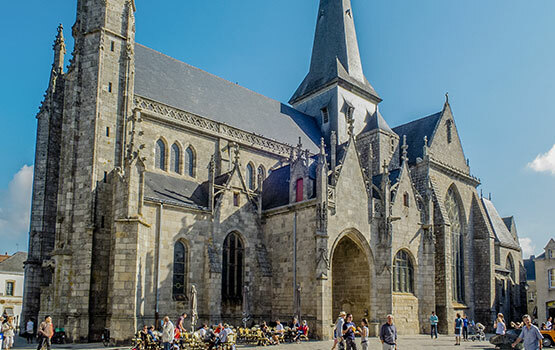 You will also have the opportunity to visit the Basilica of Sainte-Anne d’Aurey, which is none other than the most important place of pilgrimage in Brittany, welcoming nearly 800,000 visitors per year. 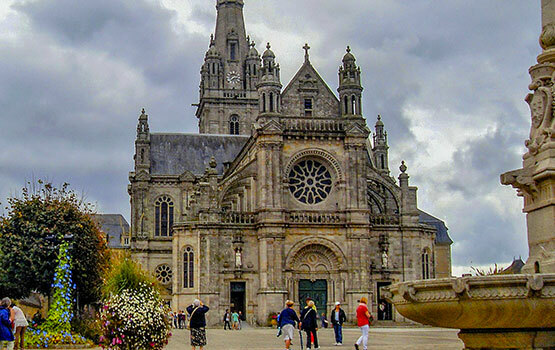 This sanctuary, in addition to being the religious centre of Brittany for Roman Catholicism, is also a cultural, architectural and heritage site with its many monuments, its exhibitions and the great ceremonies that take place there. It is also a restful place to walk thanks to its gardens, and fascinating by its imposing monuments displaying a unique architecture in its kind. Also include a visit to the fabulous Saint-Dégan Ecomuseum in your agenda, a program that will delight antique enthusiasts. Games are offered to make the visit even more interesting. The exhibits reveal the evolution of craft and industrial activities in Brittany. Continue with the Fleuriot gallery which gathers an impressive collection of artistic works reflecting the remarkable Breton know-how. It’s the perfect place to buy souvenirs before you leave. A trip in Morbihan would not be complete without having discovered its famous gulf which shelters one of the most beautiful bays of Europe. This inland sea of Brittany is dotted with islands and islets that yachtsmen like to sail on mini cruises. The beautiful and diverse landscape is a real delight for visitors. Sublimated by an oceanic microclimate which gives it a mild climate and a warm sea, the Gulf of Morbihan is the jewel of the Morbihan Regional Natural Park. The exceptional geographical and geological situation of the Gulf of Morbihan encourages the development of a rich and varied biodiversity. It is especially famous for its ornithological reserve: it is the richest zone in migratory species in France which hosts between 60 000 to 130 000 individuals during the winter season. This small sea also shelters some protected areas, notably the Séné marsh and the Pen an Toul marsh. While the region’s economy has long focused on agriculture and oyster farming, tourism has now become its main development sector. Faced with the “Apple-converted-space”> rush of tourists and vacationers who come to recharge their batteries, various institutions concerned with the preservation of the ecosystem have implemented regulations to preserve the natural environment. For example, navigation is prohibited in the 300m strip along the coasts of St Gildas-de-Rhuys, Arzon, Sarzeau and Île aux Moines. Night navigation is also not recommended due to the absence of lighting. The granitic ridge of the Landes de Lanvaux, the town of Vannes and its exceptional heritage, the idyllic landscapes that are revealed during a hike on the Rhuys peninsula, the countless boaters who criss-cross the inland sea… the Gulf of Morbihan offers a wide range of landscapes to discover and activities to do. You won’t get tired of it! Want to cut yourself off from the modern world and plunge into an atmosphere of another era? Discover Guérande, a medieval fortified city perched on a hillside overlooking the estuaries of the Vilaine and Loire rivers. The entire history of the municipality, whose first occupation dates back to the Neolithic period as evidenced by numerous remains such as its menhirs, is strongly marked by the salt industry. It is located on the Guérande peninsula surrounded by the Atlantic to the west and by the Brière marsh to the west, and which connects to the mainland by a narrow passage at the level of the commune of Saint-Lyphard. It is located 16.6 km as the crow flies west of Saint-Nazaire, 67 km west of Nantes and about 44 km southeast of Vannes. Guérande is classified as a City of Art and History, and its entire landscape seems to tell you one of the stories that shaped its history. What has contributed to its prosperity are its famous salt marshes which stretch over several communes. The very first of them dates from the 7th century. These salt works produce over 10,000 tonnes of salt each year, earning it the nickname “Salt Land”. Guérande salt obtained the red label in 1991, which also allowed the region to be classified “Sites Remarquables du Goût” in 1995. The salt marshes have allowed it to be classified as a “natural area of ecological, floristic and faunistic interest”. They are also included in the Natura 2000 classification. This site contains a rich biodiversity which consists in particular of more than 180 species of birds, marine animals, amphibians, otters… but also a generous but fragile flora. What fascinates most in the city of Guérande is its sumptuous ramparts perfectly preserved. Spreading over more than 1 300 m, they are among the best preserved in France and the most complete in Brittany, classified as a historic monument since 1877. By following the emblematic path of the round, you will be able to traverse one third of its length. These remarkable ramparts consist of four gates and six towers. The Saint-Michel Gate, the main entrance, evokes the power of the city during the Middle Ages through its atypical architecture. This door forms the logis-châtelet which today houses the tourist office of the city. Discover also the exhibition room of the photographs and other testimonies of the internment camp of Guérande. You must have a good heart when you see these photographs evoking the daily life of these men, women and children prisoners in this French concentration camp. The commune of Guérande has 12 monuments listed in the inventory of historic monuments. Among them are the dolmen of Sandun, the menhirs of Bissin, the chapel and Keroland, the castle of Careil, the collegiate church of Saint-Aubin and many others. As for protected areas, it has four listed on the National Inventory of Natural Heritage. More than 5 ha of its territory is wooded and the salt works cover a total of more than 23 000 ha. The Batz salt marsh area is the most emblematic of these natural areas. The fortified city of Guérande is a world apart that must be discovered without haste !